Second execution of the query has encountered a change in the execution plan. But it has not been ‘accepted as yet even though it has been ‘enabled’. Plan was verified: Time used 1.457 seconds. Failed performance criterion: Compound improvement ratio <= 1.16. The following steps assume that a failover has been performed to a physical standby database and that Flashback Database was enabled on the old primary database at the time of the failover. This procedure brings the old primary database back into the Data Guard configuration as a physical standby database. Shut down the old primary database (if necessary), mount it, and flash it back to the value for STANDBY_BECAME_PRIMARY_SCN that was determined in Step 1. Step 4 Start transporting redo to the new physical standby database. On the new standby database, you may also need to change the LOG_ARCHIVE_DEST_n initialization parameters so that redo transport services do not transmit redo data to other databases. Redo Apply automatically stops each time it encounters a redo record that is generated as the result of a role transition, so Redo Apply will need to be restarted one or more times until it has applied beyond the SCN at which the new primary database became the primary database. Once the failed primary database is restored and is running in the standby role, you can optionally perform a switchover to transition the databases to their original (pre-failure) roles. See upcoming post "Perfoming a Switchover to a Physical Standby Database" for more information. During media recovery in a Data Guard configuration, a physical standby database can be used to detect lost-write data corruption errors on the primary database. This is done by comparing SCNs of blocks stored in the redo log on the primary database to SCNs of blocks on the physical standby database. If the SCN of the block on the primary database is lower than the SCN on the standby database, then there was a lost-write error on the primary database. Note: Because lost-write errors are detected only when a block is read into the cache by a primary and the corresponding redo is later compared to the block on the standby, there may be undetected stale blocks on both the primary and the standby that have not yet been read and verified. These stale blocks do not affect operation of the current database because until those blocks are read, all blocks that have been used up to the SCN of the currently applied redo on the standby to do queries or updates were verified by the standby. NO REDO AT OR AFTER SCN 389667 CAN BE USED FOR RECOVERY. This last message may appear significantly later in the alert file and it may have a lower SCN than the block error messages. Also, the primary database may operate without visible errors even though its datafiles may already be corrupted. The recommended procedure to recover from such errors is a failover to the physical standby, as described in the following steps. 1.Shut down the primary database. All data at or after SCN printed in the block error messages will be lost. When you rename one or more datafiles in the primary database, the change is not propagated to the standby database. Therefore, if you want to rename the same datafiles on the standby database, you must manually make the equivalent modifications on the standby database because the modifications are not performed automatically, even if the STANDBY_FILE_MANAGEMENT initialization parameter is set to AUTO. The following describe how to rename a datafile in the primary database and manually propagate the changes to the standby database. If you do not want the standby database to have the same physical structure as the primary database, then these steps are not required. Changing the size and number of the online redo log files is sometimes done to tune the database. You can add online redo log file groups or members to the primary database without affecting the standby database. Similarly, you can drop log file groups or members from the primary database without affecting your standby database. However, these changes do affect the performance of the standby database after switchover. Caution: Whenever you add an online redo log file to the primary database, you must add a corresponding standby redo log file to the standby database. If Redo Apply is running, you must cancel Redo Apply before you can change the log files. Repeat the statement you used in Step 3 on each standby database. Restore the STANDBY_FILE_MANAGEMENT initialization parameter and the Redo Apply options to their original states. Generate a transportable tablespace set that consists of datafiles for the set of tablespaces being transported and an export file containing structural information for the set of tablespaces. Copy the datafiles and the export file to the primary database. Copy the datafiles to the standby database. The datafiles must be to the directory defined by the DB_FILE_NAME_CONVERT initialization parameter. If DB_FILE_NAME_CONVERT is not defined, then issue the ALTER DATABASE RENAME FILE statement to modify the standby control file after the redo data containing the transportable tablespace was applied and failed. The STANDBY_FILE_MANAGEMENT initialization parameter must be set to AUTO. FileUsing the SQL CREATE CONTROLFILE statement with the RESETLOGS option on your primary database will force the primary database to reset the online redo log file the next time the primary database is opened, thereby invalidating the standby database. If you invalidated the control file for the standby database, re-create the file. If you invalidated the standby database, you must re-create the standby database. When you perform a DML or DDL operation using the NOLOGGING or UNRECOVERABLE clause, the standby database is invalidated and might require substantial DBA administrative activities to repair. You can specify the SQL ALTER DATABASE or SQL ALTER TABLESPACE statement with the FORCELOGGING clause to override the NOLOGGING setting. However, this statement will not repair an already invalidated database. SQL> insert into emp2(empno,ename) select s1.nextval,'ABCD SALES HOLA' from emp2 where rownum<=1000; 1000 rows created. CLONE DATABSE(duplicate database): Use the DUPLICATE command to create a copy of a source database. A duplicate database, is a copy of the source database with a unique DBID which RMAN generated. Because a duplicate database has a unique DBID, it is independent of the source database and can be registered in the same recovery catalog. Following are steps of an example where sorce(target) database and clone(duplicate or auxilary instace) are on different machines. #3 Make tns entry for source and clone (say auxilary or target or duplicate ) instance. 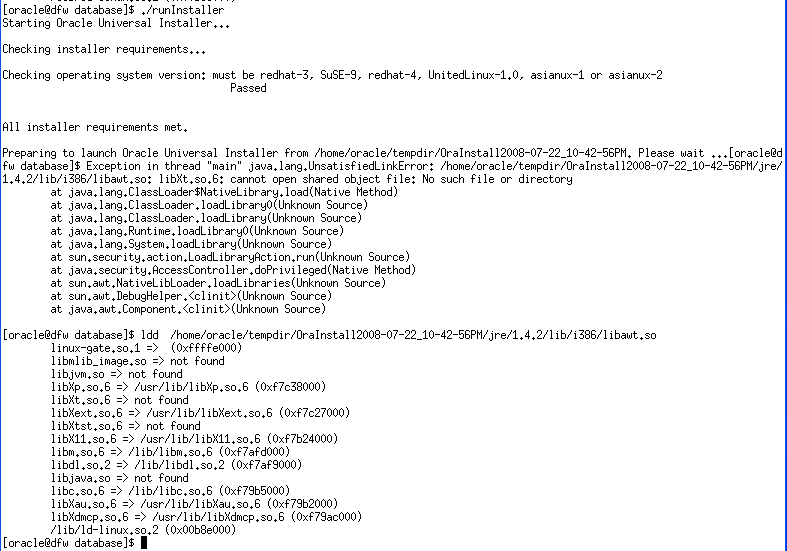 # Minimum parameters file in $ORACLE_HOME/dbs/initprod at clone oracle home. #6. ftp or scp copy the backups taken at step# 2 to same locations on duplicate(clone) database node. STANDBY DATABASE: A standby database, which is a special copy of the source database (called a primary database in a Data Guard environment) that is updated by applying archived redo logs from the primary database. A standby database does not get a new DBID. steps for creating standby database using RMAN are similar to steps for creating duplicate(clone) database. To create a standby database with the DUPLICATE command you must connect as target to the primary database and specify the FOR STANDBY option. A database in a Data Guard environment is uniquely identified by means of the DB_UNIQUE_NAME parameter in the initialization parameter file. TheDB_UNIQUE_NAME must be unique across all the databases with the same DBID for RMAN to work correctly in a Data Guard environment. Recovery of a Standby Databas By default, RMAN does not recover the standby database after creating it. RMAN leavesthe standby database mounted, but does not place the standby database in manual or managed recovery mode. 1.RMAN begins media recovery. If recovery requires archived redo log files, and if the log files are not already on disk, then RMAN attempts to restore backups. 2. RMAN recovers the standby database to the specified time, system change number (SCN), or log file sequence number, or to the latest archived redo log file generated if none of the preceding are specified. 3. RMAN leaves the standby database mounted after media recovery is complete, but does not place the standby database in manual or managed recovery mode. Assume that you want to duplicate this database to host2, which has the same file system /oracle/dbs/*, and you want to use the same filenames in the duplicate database as in the source database. In this case, specify the NOFILENAMECHECK option to avoid an error message. Because RMAN is not aware of the different hosts, RMAN cannot determine automatically that it should not check the filenames. If duplicating a database on the same host as the source database, then make sure that NOFILENAMECHECK is not set. Otherwise, RMAN may signal the error. Active Database Duplication: Beginning from Oracle 11g it has ability to create duplicate databases directly without the need for a backup,known as active database duplication. Its requirement is source database have to be in ARCHIVELOG mode..Both the source and destination database servers require a "tnsnames.ora" entry for the destination database. SET FAL_CLIENT="inst3" COMMENT "Is standby"
SET FAL_SERVER="inst1" COMMENT "Is primary"